It is possible that building a new airport would be easier than the task facing Gatwick Airport. After 20 years of underinvestment by the previous owner, CIO Stuart Birrell is looking for a team who can deliver a complete technology overhaul. It is possible that building a new airport would be easier than the task facing Gatwick Airport. Global Infrastructure Partners, which bought Gatwick from BAA last year, says the airport needs a complete technology facelift after 20 years of underinvestment by the previous owner. Of the 133 systems at Gatwick, all but two need to be upgraded. About half of them will be cloned from BAA's old systems and re-installed, but the other half will need to be rebuilt or replaced. Over the next 18 months, IT staff need to separate the technology from Heathrow Airport's systems, on which Gatwick is largely dependent, at the same time as working out what they want to improve. Stuart Birrell, chief information officer at Gatwick, is looking for a team and a set of IT companies who can help him meet the challenge. 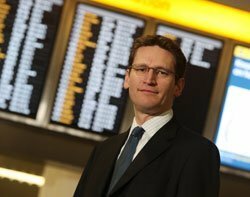 "From an IT systems point of view, Gatwick is effectively terminal six at Heathrow," says Birrell. "Everything is run at Heathrow, all the knowledge base is there. We have to effectively cut the links to Heathrow and create all the systems and technologies here. Everything at the moment is for multiple airports, and we need something that will run a single airport." A lot of new CIOs have some transformation work to do, but the new team at Gatwick has more to do than most. Global Infrastructure Partners is spending £1bn across the airport in an attempt to be more proactive than its predecessor. "We are refurbishing and rebuilding the whole airport, and IT is a fairly interesting chunk of that," Birrell says. The project will be interesting, he said, because the company recognises the value that technology can bring and realises it needs to be an integral part of the improvement plans. Not only does IT have the potential to make the airport more efficient, but it could be a crucial part of giving it a competitive edge over Heathrow. "There is a basic need to separate a very complex and expensive IT estate from Heathrow. Right now, IT is an inhibitor to the plans that the new owners want to carry out. I am right there in the middle of the investment plans to transform the airport because it is a key enabler to achieving the company's goals. The CEO is very clear that IT is a catalyst for changing the way we do business." Gatwick changed ownership after a Competition Commission inquiry in 2008 ruled that BAA's ownership of seven UK airports was a monopoly, and ordered that three be sold. In November 2008 the sale process started, and 2009 was spent preparing Gatwick for the move. "The first quarter was about preparing information, putting down all the key attributes and aspects of the business. This led us to understand the business better than it had probably been understood before. BAA had cast it adrift a little," Birrell says. Now, the company is working on turning Gatwick into a place they hope airlines and customers will want to travel from. The IT team's work is split into two: first, separating systems from BAA. They have 18 months before Heathrow stops supporting and running Gatwick's systems. The second project is the more interesting, Birrell says, and involves transformation. Birrell says he is looking at what the airport needs to do differently, and what needs to be shut down "From an IT point of view it is brand new, all the core systems that run the airport we are pretty much changing," he says. One priority is to simplify the IT. The airport has an Oracle ERP system that is almost eight years old and has a lot of customisation, BAA is replacing the system at Heathrow, and Gatwick will do the same. Much of the back office will be run on off-the-shelf systems, says Birrell. "Even our phone system is complex, with 4,500 phone lines and six phone exchanges. It is such a fragmented world. The new systems will be much simpler. The back-office systems here are no different to other companies, so we can use off-the-shelf systems. The airfield is unique, but the back office is common," he says. "We will fit standard processes to standard systems, rather than trying to customise. The only way your back office can give you competitive advantage is by being simpler and more agile." Many of the systems used to run the airfield will be left as they are for now, with the initial focus on rebuilding the back office. Airfield systems need more testing and more caution when introducing new processes, Birrell says. The point of the current work is not just to improve the way things run, but to make things easier for the airport's employees. "We even need to replace the desktop computers. The user experience of our employees is dreadful. How do you attract good staff and motivate people when you have bad systems?" says Birrell. The airport's vision, he says, is to improve the experience for everyone, so the name Gatwick is no longer synonymous with the stressful queues and unpleasant environment customers often associate with airports. "It is us competing for the first time. The passenger experience and customer service aspects are extremely important. People often have less than favourable experiences here and we do not want to see that happening," says Birrell. "We are asking what has BAA done in the past and what is the complete opposite of that? It is a very different world emerging and we are embracing that. It is all about giving people information and enabling them to see what is going on. People find it a stressful experience until the departure lounge, and we are trying to make it a more relaxing experience." With any luck, an element of competition will spur airports into making the whole process less depressing for passengers. Gatwick hopes to use IT to tackle the problems and attract more passengers, with several main projects smoothing passengers' journey through the airport. First, the check-in process needs an overhaul, with plans to use web technology to offer internet check-in and an aim to make the whole process a lot quicker and smoother. Birrell says the security process needs work as well. Much of this will be physical construction work, but space needs to be left to allow the airport to keep up with technical changes - measures such as body scanning and new types of biometrics are being introduced all the time. Better collaboration across the airport could lead to many improvements, for example, reducing the number of planes that are taxiing on the runway waiting to take off, hopefully leading to a smaller carbon footprint. And there are plans to spend £100m rebuilding and replacing the baggage system, with hopes for quick bag drops and a smoother process. Gatwick is looking for between 20 and 25 IT staff and between three and six service partners to support its transformation programme. Birrell says he remains open to all ideas, including cloud computing, but he advises anyone facing a big project like his to not think about the technology too much. "My advice would be to invest in good people. For the first three months in Gatwick I spent 80% of my time recruiting people and it is paying big dividends now. Otherwise you have to do it all yourself. Or you pay a fortune for third-party consultants to do it for you," he says. "Having good, motivated people is worth an absolute fortune. That is what makes you successful or not - technology is pretty irrelevant. Having the people there is what is making it work."